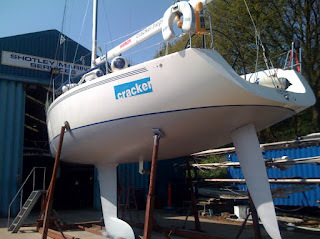 The company's office is a bit late onto the race course this year but Cracker goes back into the water today (hurrah!) after spraying with her new Teflon® antifouling - and very fab she looks too, as you can see. But tall. Of course one problem with having 9 foot of keel plus a very-large-lump-of-lead hanging underneath and a berth on the really-jolly-shallow UK's East Coast is that you spend a lot of time avoiding the jolly- shallow bits! But it's worth it though eh?, I mean LOOK at her... sigh.